Maria Shonyo, president and founder of Vela Technologies, has 25 years experience in the medical industry helping medical device and healthcare IT companies assess new market opportunities, bring new products to market, and position and promote existing products and services. Since the company was established in 2001, Vela Technologies has proudly served over 50 clients ranging from small early-stage startups to large international corporations. With broad marketing and business expertise spanning the entire product life cycle, Ms. Shonyo has guided the assessment, development, launch and support of over 75 healthcare-related products varying from high-end capital equipment and healthcare IT solutions to low-cost consumable devices. 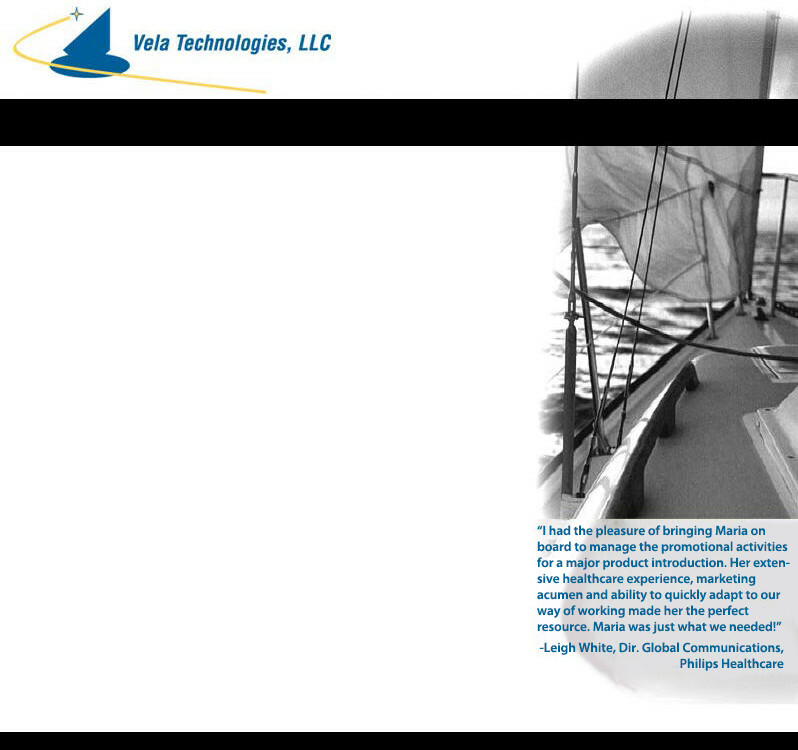 Prior to founding Vela Technologies, Maria was Product Manager for the premier line of anesthesia monitors at Datex-Ohmeda (now GE Healthcare). Prior to Datex-Ohmeda, Maria held positions of progressing responsibility in the Marketing department of GE Marquette's Invasive Cardiology division. Before entering the medical field, Maria excelled in engineering and software development and managed advanced projects for the US Dept of Defense. Maria’s diverse background, unique skill set and commitment to excellence have consistently earned her admiration and respect from clients and colleagues alike. She understands the challenges of working in demanding corporate environments and the pressures of striving to stay one step ahead of the competition. With a fundamental goal of bringing value to clients and contributing to their success, Vela Technologies offers proven solutions to the most pressing needs.